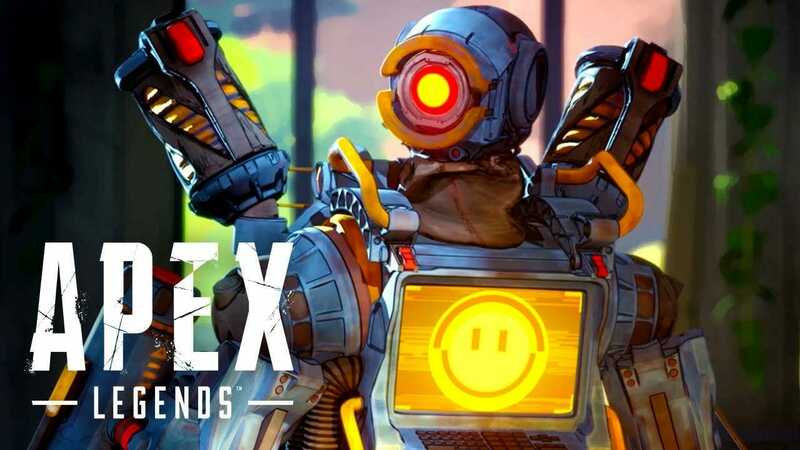 Yesterday, Respawn Entertainment released their latest battle royale title-Apex Legends. It is an exciting new take on the popular BR phenomenon that has gripped the gaming world for the last couple of years. The game has a sci-fi theme to it with a first-person mode only. The game was released across PC, PS4, and Xbox One, however, as is the case with most PC releases, players have been experiencing performance issues with the game even on decent setups. 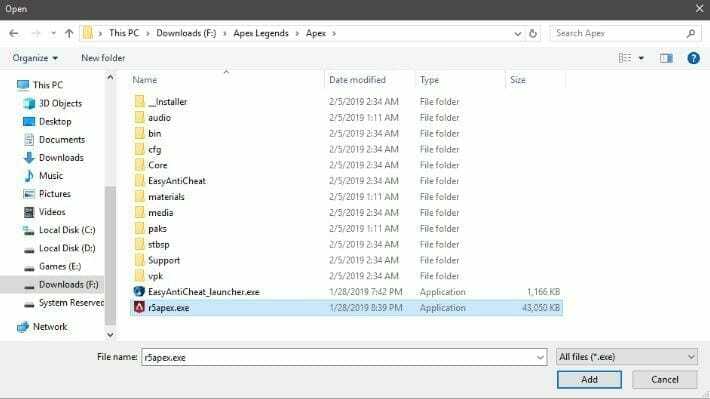 In this article, I will show you how to fix Apex Legends Low FPS issue on PC which seems to be the most common problem for PC players right now. 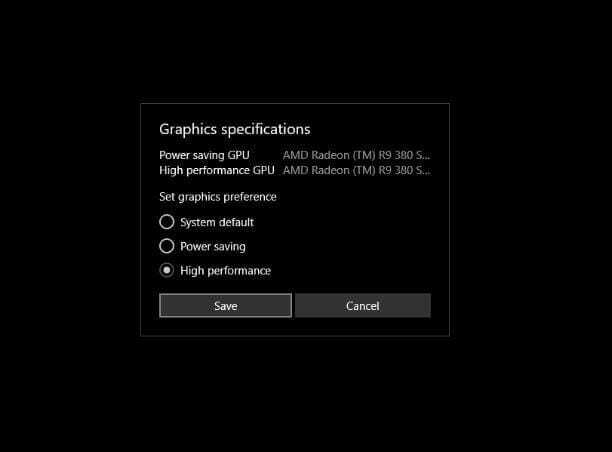 A common problem people have reported is that the game does not recognize the main GPU and instead uses the builtin one. This naturally causes the game to achieve low fps. To fix this follow the steps below. This works for Nvidia and AMD cards alike. 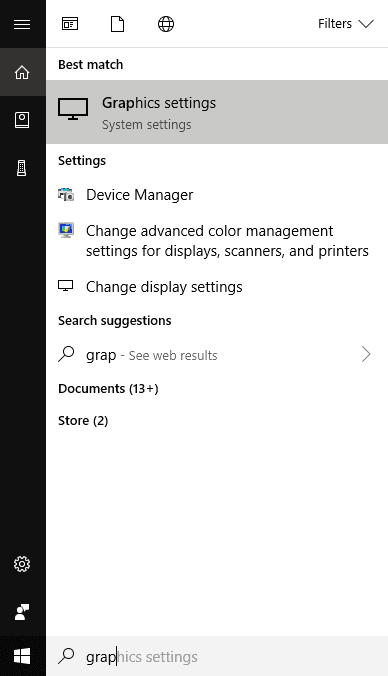 Step 1– Click on the search bar in the bottom left of your Windows 10 and type Graphics settings. Step 2- Now click on “Classic App” and then browse and select the .exe file of your game. 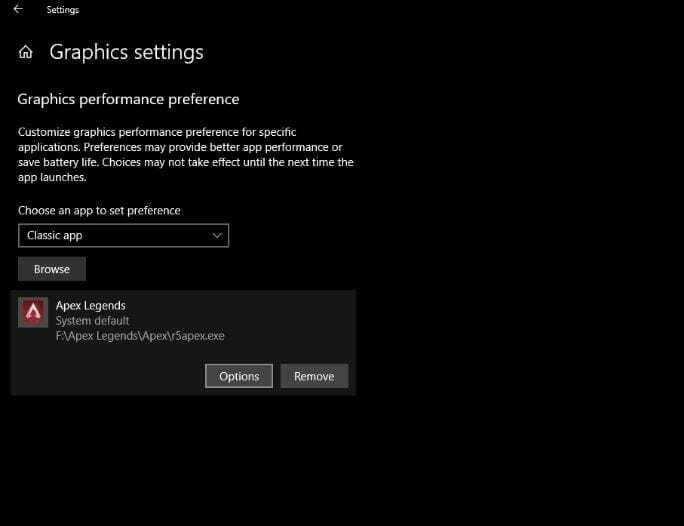 Step 3- When a new window pops up, click on options and check the “High performance” option. This should work for most people, if not then you can fiddle around in the control panel of your Nvidia GPU to squeeze a bit more power out of your card. See the Fix #2 below. In most games, tweaking the Nvidia control panel settings can get you a slight fps boost. Step 1- Right-click on the desktop and then click on the Nvidia Control Panel. Click on “Manage 3d settings” on the left. Now choose Apex Legends from “program settings”. Now change Power management mode to “Prefer Maximum Power”. Step 2- In the same Nvidia Control Panel, you can change “pre-rendered frames” to 1, this improves performance on less powerful systems. Step 3- Another useful tweak in Nvidia Settings is to turn shader cache on. In most cases, this would help improve FPS. You can always revert back to default settings should you notice any negative change in the performance of the game. Let me know in the comments if the above-mentioned tips helped to fix Apex Legends Low FPS problem. You can also check out our Apex Legends System Requirements article while you are here. You may also want to check more of our Apex Legends fixes. How To Fix Apex Legends Stutter Issue In Full-Screen Mode NEW!!!! Also, check out Assassins Creed Dynasty Accidental leak article I did the other day.